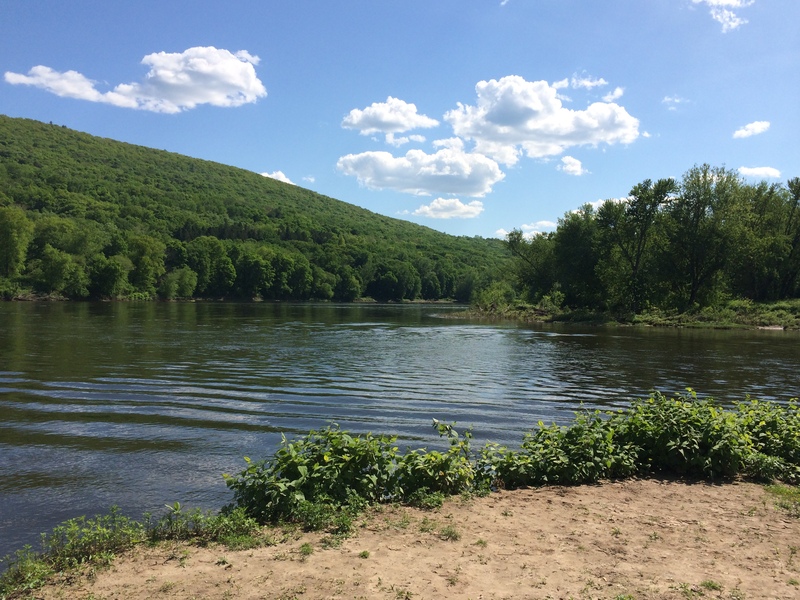 Back to writing after a few days in Pennsylvania. I hate taking time off in the middle of a book, but at least it was a scenic trip. I’m pleased to announce that Torrent is here! 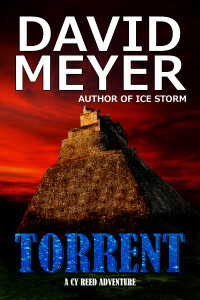 Torrent is the third book in the Cy Reed Adventure series. 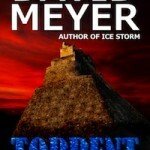 This time, Cy Reed matches wits with a long-deceased Maya architect as he races to uncover the shocking truth behind one of the greatest treasures of all time. You can pick up the e-book at any of the retail outlets listed below. The paperback is available through Amazon.com, other online outlets, or your local bookstore. 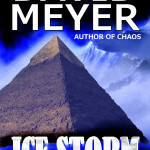 Ice Storm is an action/adventure novel and the second in the Cy Reed Adventure series after Chaos. It features all of the things you’ve come to expect from me…forgotten history, crumbling ruins, lost treasure, and strange monsters. 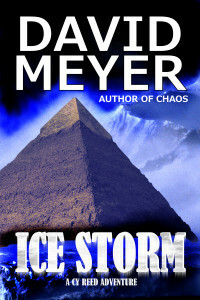 If you like Indiana Jones or novels by the likes of Clive Cussler, James Rollins, Steve Berry, or Douglas Preston, then Ice Storm is perfect for you. 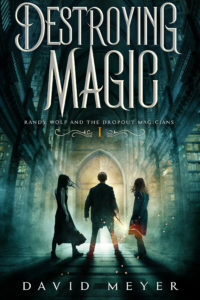 You can pick up an e-reader version at any of the retail outlets listed below as well as the paperback at Amazon.com (all outlets should be available in a few days). Deep in the heart of Antarctica lies a forgotten military installation. Deadly secrets are secured behind its doors…including the remnants of a decades-old plot to devastate mankind. Disgraced treasure hunter Cy Reed is on the trail of an incredible treasure when a cargo ship mysteriously explodes. At the same time, a team of geologists makes an astonishing discovery that could rewrite ancient history. And a beast of impossible origins unleashes a bloody rampage across the ice. As Reed unravels the mysteries behind Antarctica’s dark past, he begins to uncover a sinister conspiracy. Plagued by ferocious storms and betrayed on all sides, he races toward an inevitable clash that could salvage his ruined reputation…or unleash hell upon the world. The slow writing pace of my development hell book, Ice Storm, has finally gotten to me. So, I buckled down last night and ripped out 6,000 words. Writing Ice Storm: It’s Time to Pick up the Pace! My “open novel” experiment for writing Ice Storm, aka my “Development Hell” book, has been a rather brutal experience. Trying to rearrange and finalize a manuscript that’s undergone way too much rewriting is no easy task. A lot of free writers like to compare a novel to a dinosaur skeleton. The idea is that the story already exists inside one’s head. It just needs to be excavated. Actually, I think that’s a pretty good way to describe how my brain works. But for reasons I’ve talked about before, the Ice Storm excavation didn’t turn out so well. Thus, I’m sitting here with a jumble of mixed-up bones. Up until now, I’ve been editing at a pace of 3,000 words per weekday and half that on weekend days. Ice Storm is about 90,000 words long, so it’s a five-week process. It’s hard enough to write a novel over multiple weeks. Editing that same novel over an extended period of time is just grueling. So, I picked up the pace yesterday. I edited 6,000 words yesterday, bringing my redraft to a word count of 63,000. I’m now in the last third of the book. If I can keep this up for another six days, my redraft will be finished. I’ll have to do another draft of course. And probably another one after that. That’s unavoidable. But this draft should put the bones in the right places. Then its just a matter of tidying up. I created storyboards for two other novels yesterday. One is a science fiction book. The other is a paranormal tale. They don’t really fit into the Cy Reed universe. Well, the second one might. The science fiction story deals with some scientific theories I’ve written about in the past. They’re not particularly well-known but I find them fascinating. I might just take a crack at this one once Ice Storm is done. The Chaos paperback is now 10% off at Amazon ($12.56)! I see a few of you have taken advantage of the sale already. For the rest of you, act now before it goes back to list price. Other than that, I’m still thinking about making adjustments to my sidebar (that one on the right with Chaos in it). I might expand it to include international bookstores. And yes, the link to buy Chaos at Diesel (see sidebar) is STILL broken. Diesel has a revised version of Chaos but doesn’t seem to have posted it yet. I emailed Smashwords but haven’t heard back from them. I traveled to my old stomping grounds in New York City this past weekend for an epic engagement party. Yes, I’m still recovering. 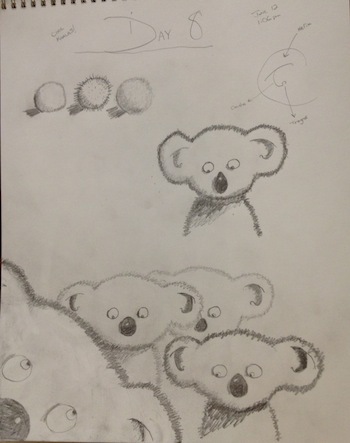 My Quest to Draw (Day 8): The topic is “Cool Koalas.” There’s something fishy about that guy in the foreground. Ice Storm: Nearing the Final Stretch! I took off Saturday and Sunday for the engagement party. But now I’m back on track with my “open novel” experiment for Ice Storm, aka my “Development Hell” book. I edited 3,000 words yesterday, bringing my redraft to a word count of 57,000. I’m guessing this will end up to be about 90,000 words, so that means I’m near the two-thirds point. It’s been a difficult couple of days. The trip to NYC threw off my rhythm. And only editing 72 pages a week is taking its toll. Unfortunately, it’s unavoidable. Ice Storm needs special care right now in order to bring it back to life. A lot of little problems will remain after this draft is done. But the larger story is finally starting to come together in a cohesive fashion. Hopefully, I can finish this redraft in the next two weeks. Then I’m going to edit it again, shooting for 120 pages a week. The goal will be to smooth out inconsistencies and add in any final creative chunks. Then I’d like to do a few read throughs in a more concentrated time period so I can see how the story flows. The more I work on Ice Storm, the more I see the problems with my old writing habits. Specifically, my tendency to rewrite early and often. For my next book, I’m going to spend more time upfront developing characters and the story. But when I start writing it, I’m not going to stop until it’s done. Julie and I drove to New York City on Saturday morning. I lived in Manhattan from 2004 to 2008. So, I always have mixed feelings about going back. On one hand, there’s a part of me that misses it. New York has a way of getting under one’s skin. On the other hand, I wasn’t particularly happy there back in the day. I worked too many hours at a job I didn’t like. And I can’t help but think I’d do it all over again if we moved back. Anyway we were there for a party celebrating the engagement of our friends Mahbubul and Kelly. I’ve known Mahbubul for more than 15 years (we were fraternity brothers) and Kelly for a little more than 15 days. So, it’s been a lot of fun getting to know them as a couple. We went to a bar and met up with a bunch of their friends, including a few more of our brothers. I don’t get together with these guys very often so we pretty much ended up talking all night. Good times. We stayed until maybe 2 or 3 in the morning. Then we went back to Mahbubul’s and Kelly’s apartment. We drank some more and watched a spattering of television until finally hitting the sack somewhere around 5am. Julie and I woke up a few hours later. We got some bagel sandwiches and coffee before hitting the road. All together, it was a good trip. Exhausting, yes. But definitely worthwhile. I finished my 8th lesson from You Can Draw in 30 Days by Mark Kistler last night. The topic was Cool Koalas. This was an interesting change of pace and my first attempt at drawing a living, breathing creature. It came out okay but I put way too much effort into the fur. Looking at Kistler’s sketches again, it’s apparent he makes the most of his lines. Overall, this was the the easiest lesson yet which I appreciated since I’m still recovering from Saturday night. The Chaos paperback is now 10% off at Amazon ($12.56)! I see a few of you have taken advantage of the sale already. For the rest of you, act now before it goes back to list price. Other than that, I’m still thinking about making adjustments to my sidebar (that one on the right with Chaos in it). I might expand it to include international bookstores. And yes, the link to buy Chaos at Diesel (see sidebar) is STILL broken. Diesel has a revised version of Chaos but doesn’t seem to have posted it yet. I emailed Smashwords so hopefully I’ll have an answer for the delay later today. 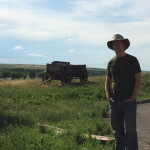 So, I didn’t get a chance to write a blog yesterday. Instead, I was shaking off the effects of a massive food coma. Ahh!!! 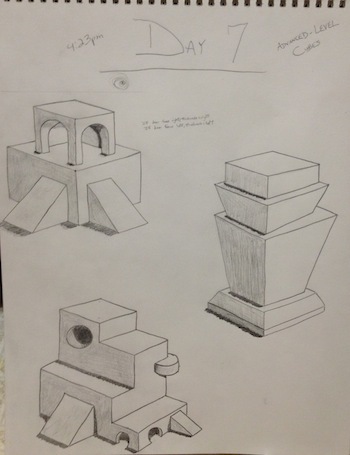 My Quest to Draw (Day 7): The topic is “Advanced-Level Cubes.” The bottom right drawing looks almost livable. The last two days constituted Days 14 and 15 of my “open novel” experiment for Ice Storm, aka my “Development Hell” book. I edited 6,000 words in total, bringing my redraft to 45,000 words. That means I’ve reached the halfway point. I wish I could say I felt the wind at my back. Unfortunately, it’s the exact opposite. The last two days haven’t been particularly good ones. The words are coming slowly and I’m having trouble focusing on my story. I find myself doing a lot of wandering (yes, literal wandering!) and daydreaming and I keep getting distracted by non-Cy Reed short story ideas. That being said, this isn’t unusual for me. I usually reel off 100 to 150 pages without any problems. Then I get antsy and start ripping apart my draft. Endless rewrites ensue. So, I’m determined to see this through. I didn’t get a chance to post an update yesterday. Truthfully, I was still “hung over” with a food coma. Julie and I had met up with some friends at a local food festival. Basically, the area restaurants set up shop in the retail shops and hand out samples. Local musicians hang out on the sidewalks and everyone walks around town trying out the different items. Some of the food is pretty fancy and a few of the restaurants manage to outdo themselves every year. Anyway I ate way too much and got that dreamy, logy feeling Julie likes to call a food coma. By the time I got home, the food coma had taken complete control and it really didn’t pass until well after I woke up. I completed my 7th lesson from You Can Draw in 30 Days by Mark Kistler last night. The topic was advanced-level cubes. Basically, the lesson built on the previous ones by adding arches and ramps to box-shaped structures. I worked a little more loosely than usual and for the most part, enjoyed myself. My perfectionism still seeps in from time to time though and I sometimes spend several minutes drawing and erasing just to get the right lines. No news to report here. Just the same old stuff. Namely, I’m still thinking about making adjustments to my sidebar (that one on the right with Chaos in it). I might expand it to include international bookstores. And yes, the link to buy Chaos at Diesel (see sidebar) is STILL broken. Diesel has a revised version of Chaos but doesn’t seem to have posted it yet. I may have to double check with Smashwords to make sure there isn’t another problem. Finally, the Chaos paperback continues to be on sale for $13.25 at Amazon. Get it and review it! I hate Tuesdays. I hated them when I worked in an office. I hate Tuesdays now. 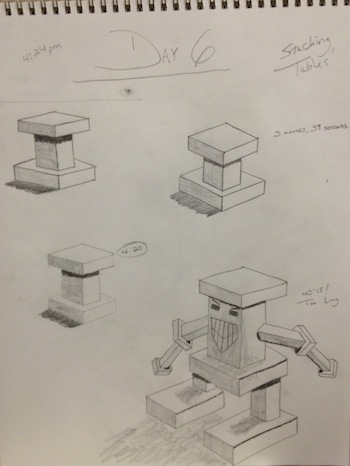 My Quest to Draw (Day 6): The topic is “Stacking Tables.” Check out the scary box monster down there…just don’t look too closely at his right leg! It’s Day 13 of my “open novel” experiment for Ice Storm, aka my “Development Hell” book. I edited 3,000 words yesterday, bringing my redraft to 39,000 words. That means I’ve got about 51,000 words still to go. This is always a hard spot for me. I’ve been at this redraft for almost two weeks and yet I’ve still got three weeks to go. In other words, this is like Tuesday to me. And I hate Tuesdays. Let me explain. These days, I work from home so the days of the week tend to run into each other. But when I used to work out of an office, I hated Tuesdays. I usually felt recharged after a weekend so I didn’t really mind Mondays. Wednesday wasn’t too bad either since that was the halfway point. Thursday was always good. I could practically feel the weekend rushing at me. And of course, Friday was my favorite work day for obvious reasons. That left Tuesday, which became my least favorite day of the week. I’m hoping to reach the halfway point of Ice Storm by Thursday. But in the meantime, everyday feels like a “writing Tuesday” to me. And like I said, I hate Tuesdays. As for other contributing factors, I’d have to point to the whole development hell thing. I’ve been working on this book for so long, it feels like I’ve written it ten times over. I’m not sick of it. But I’m definitely not going to mind moving onto the next story. Plus, I caught a cold from my wife so I’m dealing with that right now too. On the bright side, I spent some time at a nearby pool yesterday. It wasn’t the ocean but I still enjoyed it. I laid out for a bit and mulled over some story ideas. I’m thinking I’d like to write one more Cy Reed novel after Ice Storm and then branch off to start a parallel series. I completed my 6th lesson from You Can Draw in 30 Days by Mark Kistler last night. The topic was stacking tables and as you can see from my sketch book, it was mostly about drawing column-like objects. He suggested readers time themselves as they complete the exercises. It took me about twice as long as he suggested, which probably means I’m being too exacting with my work. I’m going to try to take a more sweeping approach the next time I pick up my pencil. So, my web traffic exploded last Thursday. The reason? A sudden avalanche of interest in the possible discovery of Amelia Earhart’s long-lost plane. 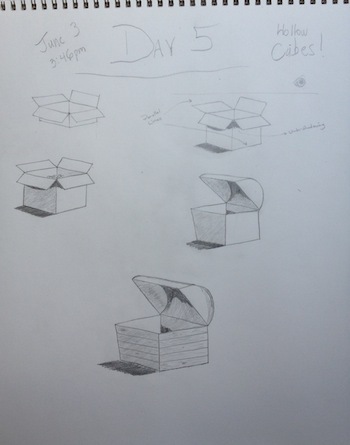 My Quest to Draw (Day 5): The topic is “Hollow Cubes.” I thought the treasure chests turned out pretty good…now I just have to figure out how to draw some sweet-looking treasure to put in them! Ice Storm: 12 Days, 36,000 Words! It’s Day 12 of my “open novel” experiment for Ice Storm, aka my “Development Hell” book. I edited 3,000 words yesterday, bringing my redraft to 36,000 words. That means I’ve got about 54,000 words still to go. I drew up a chapter from scratch yesterday. It’s written from the point of view of a scientist named Holly Whitlow. She’s got a secret deep in the heart of Antarctica, one that could get her into a lot of trouble. Initially, I hadn’t planned to do a whole lot with the chapter. I just wanted to reveal her secret and give her a quiet emotional moment. But I found myself inspired and turned out a pretty good scene with some emotional resonance. 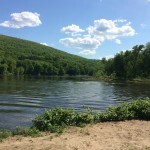 I love days like that…one moment I’m sort of going through the motions, the next I’m experiencing a creative outburst. Last Thursday, my web traffic exploded. In case you haven’t heard the news, a group named TIGHAR announced it had discovered a sonar image that might be the wreckage of Amelia’s long-lost plane. I’ve been writing about Amelia Earhart’s doomed flight and TIGHAR’s various expeditions to find it for over a year now (in case, you’re interested, here’s my Amelia Earhart archive). Anyway for the last couple of days, my Amelia Earhart articles have received lots of traffic. But it didn’t last. A lot of people visited my site and clicked around on the Amelia Earhart stuff. Then they took off, presumably to search for more information on her. I was tempted to do an update, Guerrilla Explorer style. But I decided not to go through with it. When I started Guerrilla Explorer, I thought I’d see more overlap for stories about mysteries of history, lost treasure, and monsters. But I’ve noticed that audiences tend to be very distinct. Bigfoot hunters, by and large, don’t seem to care much about Amelia Earhart and vice versa. So, while an Amelia Earhart update might get me a few days of heavy traffic, it seemed unlikely to draw in regular readers. 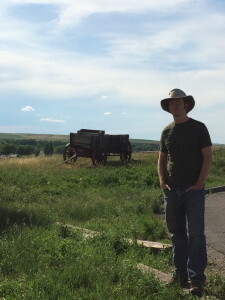 And honestly, I’d rather build a long-term audience who’s interested in my books and other creative endeavors than try to snag a bunch of short-term visits. I completed my 5th lesson from You Can Draw in 30 Days by Mark Kistler last night. The topic was hollow cubes and as you can see from my sketch book, it was mostly about drawing boxes and treasure chests. It’s amazing how the little things matter when drawing a picture. The inner line of the box and the inner lines of the treasure chest lid really make those drawings pop out of the page. By the way, when it came time to freewheel it at the end, I couldn’t figure out what to do. My drawings aren’t bad considering I’ve only been at this for a few days. But I haven’t reached the point yet where I’m taking the art into my own hands and adding my own personal details. I imagine that will come eventually, but for the moment, I’m basically just following instructions and trying to figure out the basics. No news to report here. Just the same old stuff. Namely, I’m still thinking about making adjustments to my sidebar (that one on the right with Chaos in it). I might expand it to include international bookstores. And yes, the link to buy Chaos at Diesel (see sidebar) is STILL broken. Diesel has a revised version of Chaos but doesn’t seem to have posted it yet. Finally, the Chaos paperback continues to be on sale for $13.25 at Amazon. Get it and review it!